Nadine Johnson is a Canadian artist that resides in Calgary, Alberta. 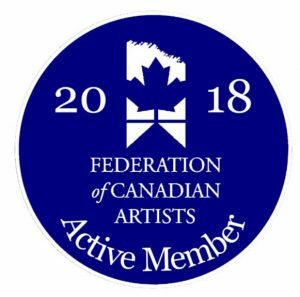 Nadine is an Active Member of the Federation of Canadian Artists, a member of the Leighton Centre in Calgary and the Kimberley Arts and Cultural Centre 64. 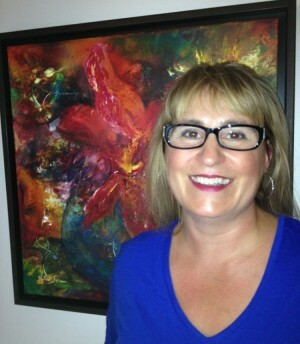 She is active in the arts community in Calgary and participates in many local art shows. Born and raised in Alberta, Nadine often draws on the beauty of the prairie landscapes and mountain vistas as inspiration for her works. Nadine is influenced by the colours in nature and the emotions they produce. Her intent is to create paintings that express and show her interpretation of the beauty that surrounds her. Whether the image is a single flower, a 200 year old house, or a rushing stream, Nadine’s skilled use of colour and light enables the viewer to feel their way into her paintings. Nadine’s paintings are vibrant and full of colour and she loves to explore different subject matter. Nadine uses Acrylics, Oil and Watercolours, as well as textures, colour, layering and movement to amalgamate everything into beautiful works of art. Nadine enjoys sharing her love for beautiful images. The interaction and connection with people through showing her art has proven to be just as rewarding as the process of producing the works.